If you haven’t walked into a store, turned on your television, or opened a magazine lately, it’s officially the holiday shopping season. With everything from gifts to food to décor, shopping is a huge part of the holiday season and it can be a little stressful. Here are some tips to help you keep ahold of your sanity and maybe even make shopping fun. 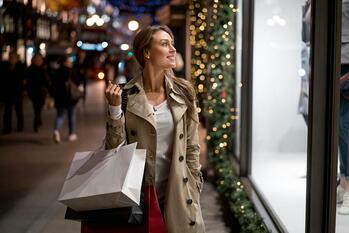 A huge source of the stress associated with holiday shopping is the money. Ideally, you should be saving for Christmas all year long to help negate some of this stress. If you haven’t already, now is the time to decide what you will spend and stick to it. You don’t want to go into the New Year with the cloud of Christmas spending over your head. For older kids, let them know what your budget is so they can set expectations. For the littler ones, stress that they won’t get everything on their list. Once your budget is in place and you have your family’s wish lists, it’s time to create a list of your own. Create organized lists for every person for which you are buying gifts. The more organized you are, the less stressed you will be. Carry this list with you every time you go out shopping. You never know when you might happen upon a deal you weren’t expecting. Once you have a list in place, start shopping now. Yes, shopping for Christmas before Thanksgiving can feel a little silly, but your future self will thank you for not being in the stores the day before Christmas. The more you can spread out your shopping time, the less likely you are to be stressed. Skip the stores all together and take advantage of online deals. During the holidays, many retailers provide free shipping, making shopping easier than ever. Just remember to take precautions to make sure those packages end up where they belong. Throughout the months of November & December, Cyprus Visa credit card holders will receive double points on all purchases. This is a great time to take advantage of our Visa Awards program and get some cool stuff. If you have any questions regarding your Visa card or would like to apply for one, check out our website or call (801) 260-7600.